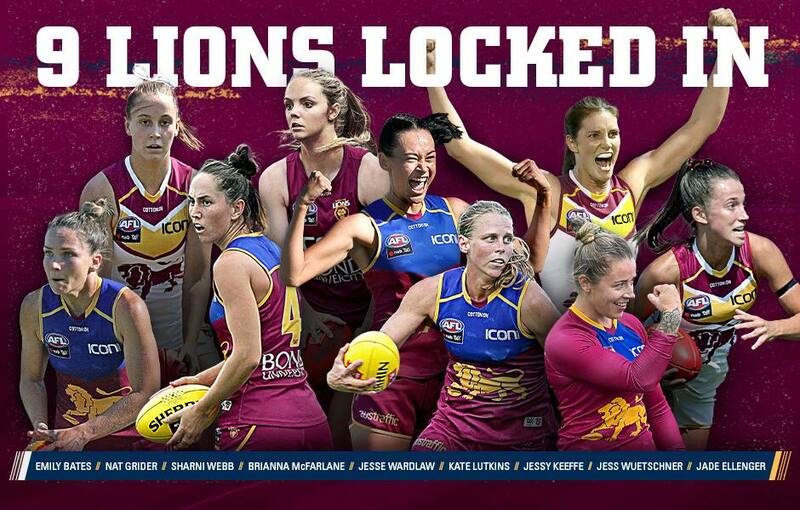 The Lions AFLW list has been bolstered by the signatures of eight experienced players and a rookie, who are all excited to tackle the 2020 season. Other sport rookie Brianna McFarlane has also re-signed and will aim to make her AFLW debut next year. Lions Women’s CEO Breeanna Brock was thrilled to announce these nine signatures. “The commitment from these players is outstanding,” she said. “Craig, myself and our coaches feel as though we are building something special with this team. “We are pleased to see so many Hyundai Help for Kids Lions Academy products coming through the ranks and going on to play exceptional football at the highest level. “Our two Best & Fairest winners are also back as well as All Australian squad members. Wuetschner’s famous left boot kicked some unbelievable goals for the Lions in 2019. “Woosh” was the Lions’ top goal kicker for the year, with a season high of three against GWS in Round 1. The Tasmanian was also named in the All Australian squad. Lutkins had another strong AFLW season off the back of her brilliant 2018 year where she was named the Club’s Best & Fairest and All Australian. “Luttsy”, a Lance Corporal of the Australian Defence Force, showed tremendous leadership on and off the field in her role as Vice-Captain. She was also named in the 2019 All Australian squad. Bates, the Club’s inaugural Best & Fairest winner produced another consistent season. The midfielder averaged 17 disposals per game and scored maximum coaches votes in the team’s Round 1 win over GWS. 2020 will be Webb’s fourth season with the Lions. The 2019 season was frustrating for the defender, with a foot stress fracture causing her to miss three games in the middle of the season. Wardlaw, a Hyundai Help for Kids Academy graduate, was outstanding in the ruck and forward line in her first AFLW season. The 19-year-old made her debut in Round 1 against the Giants and kept her position for the remainder of the season. Keeffe made her long-awaited AFLW debut in Round 4 against the Bulldogs, after fighting for a spot for nearly two years. She would go on to play all of the remaining games and impressed in the ruck with her pressure and energy. Grider made her debut alongside Keeffe and was strong in the defensive backline. The Lions Academy graduate would go on to play two games for the year. Ellenger, another Lions Academy alumni, had an unforgettable debut in Round 6 against Carlton. The forward kick a goal in her first touch and would go on to score another major. McFarlane’s 2019 pre-season showed great potential but unfortunately a shoulder injury suffered in December, ruled her out for the entire year. The AFWL Trade and Sign period will end on April 18.